According to a Nerdwallet study, nearly half of student loan borrowers say they could have gotten by with a smaller loan. Now more than ever, it’s critical for potential borrowers to understand their future college costs to get the proper loan amount. By weighing all the options available for financial aid and having a clear understanding of college and living expenses, you may avoid costly over borrowing for the financial help you need. The majority of students are responsible for covering 50-74% of the overall cost of their degree, including living expenses, books and any other costs not covered by scholarships, according to a recent Ascent survey1. 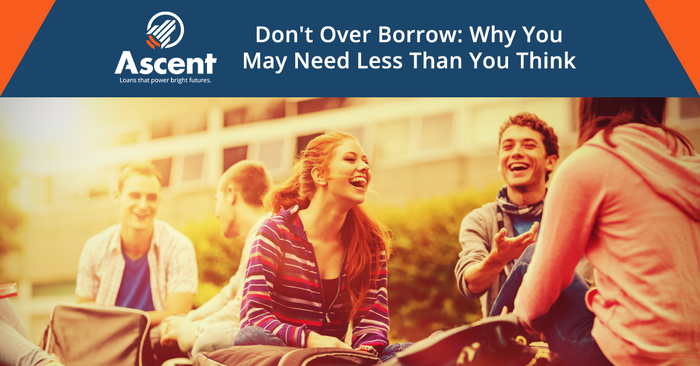 If you are one of the many students who are responsible for covering the majority of college expenses, it’s understandable why you might over borrow. Starting out at new university, students may feel it’s better to be safe than sorry. Still, many students overshoot the amount of money they need to borrow. On top of understanding college costs, as you grow your financial awareness you can learn to save and spend wisely, which can significantly reduce your overall college expense. To help ensure that you borrow the right amount, your school should provide a net cost calculator which factors in room and board, fees and books, along with tuition. There may be other expenses that you’ll want to factor in yourself, such as medical, transportation or entertainment costs. Spend some time visualizing what a month’s worth of expenses might be to understand expenses that your school may not give information on. Do you like to cook at home or do you go out to eat daily? Is a spring-break vacation a yearly staple? Make sure to add all of these potential costs to your expected expenses. These are the types of questions that can help determine your indirect college costs and give a more wholistic idea of your overall budget during these years. If you would like some help getting started, the U.S. Department of Education offers free access to this budgeting tool. It will walk you through the budgeting process from start to finish. According to a CNBC survey, many students borrow more than they need so that they can cover inflated lifestyle costs. This means they’re using student loans for purchases beyond their means, such as cars, clothes and phones. Treating a loan for college – which provides a return on investment – as a means to buy items that depreciate in value can be a costly mistake, and in some cases may even violate the terms of the loan. Though it may be tempting to purchase a new car with your student loan money, perhaps Mom’s handed down minivan will do just fine, and more of your student loan can go toward tuition. In addition, consider areas where you can save money while at school. Often times, meals cooked at home are less expensive than eating out. If you are a commuter student, consider carpooling with a friend or classmate to reduce gas expenses. These are just a couple ways to lessen the total amount of your student loan. When you pay for something with loan money, it actually costs more than just paying with cash would. This is due to the accrued interest that adds up. If you spend $15 a week on pizza, which is $1,800 after 120 weeks, that same cost would be nearly $500 more if you had paid for the pizza out of a standard 5% federal student loan. Therefore that $15 pizza now costs over $19 each. That’s a lot of cheese! That being said, you still have to eat. Many private loans such as Ascent Student Loans provide assistance with eligible living expenses such as housing, textbooks and school supplies so that you can stay focused on your studies. Once you have a good grasp on your college costs, you can more accurately determine how much money you may need to borrow. But what other sources of college assistance are out there? You’ll want to not only consider your college expenses, but also your sources of income as well. As we note in Student Loans 101, there are several avenues for financial aid besides loans, including scholarships, grants and fellowships. Fully exploring these options before you take out a loan can help make sure that you don’t borrow more than you need. Private student loans are a way to bridge the gap between other forms of financial aid and your true college expense. If you need help determining which loan amount is right for you, our team at Ascent is motivated to get you the assistance you need. Reach out to us today by clicking here. Ascent Student Loans surveyed 1,027 college students currently enrolled in a four-year bachelor’s degree program who have taken out student loans. The survey was fielded using the Qualtrics Insight Platform, and Fulcrum provided the panel. Fielding was executed in May 2018.